On April 9, 2017, in an event reported worldwide, Dr. David Dao was forcibly dragged from his seat on a United Airlines flight by security officials of the Department of Aviation. Dao had refused to give up his seat on the overbooked flight. The United personnel said that the seat was need for one of four United crew members who were to fly out of the same destination as Dao. 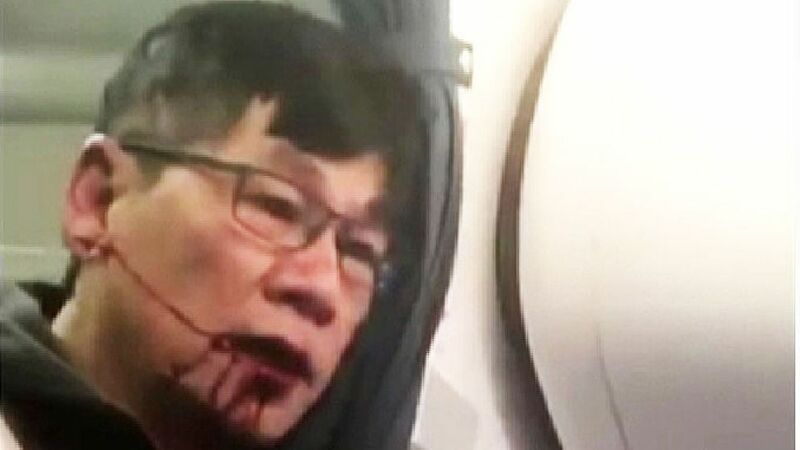 The 69 year-old Dr. Dao screamed when his face was slammed into the headrest by the security officers. He was then dragged on his back up the aisle, his belly exposed. He somehow got back on the plane, muttering, “I have to go home.” One of the videos show him clutching the curtain dividers on the plane, his face bloody, as he repeats, “Just kill me.” He was then removed on a stretcher. As a result of all this, Dao lost two front teeth, suffered a concussion and a broken nose, and will need reconstructive surgery, says his lawyer. As an Asian American, I’m not writing here about what this incident says about the airline industry and the practice of overbooking. Instead, I want to focus on the response to Clio Chang’s article on the Atlantic website where she asked whether being Asian affected the way Dr. Dao was treated. In her article, Chang reached no definite conclusion, but she did argue that the fact that the question of race was not brought up by almost all the media indicates an absence of awareness of the issues Asian Americans face. Do you know the real reason Dr. Dao was so brutally tackled and thrown off that United flight? It was all about white supremacy. I mean, what isn’t these days? That idea is from the New Republic. Yes, the cops “seemed” to be African-American, as the author concedes, so the white-versus-minority paradigm is a little off. Yes, this has happened before to many people with no discernible racial or gender pattern. Yes, there is an obvious alternative explanation: The seats from which passengers were forcibly removed were randomly assigned. New York published a similar piece, which argued that the incident was just another example of Trump’s border-and-immigration-enforcement policies toward suspected illegal immigrants of color. That no federal cops were involved and there is no actual evidence at all of police harassment of Asian-Americans is irrelevant — it’s all racism, all the time, everywhere in everything. It’s easy to mock this reductionism, I know, but it reflects something a little deeper. Asian-Americans, like Jews, are indeed a problem for the “social-justice” brigade. I mean, how on earth have both ethnic groups done so well in such a profoundly racist society? How have bigoted white people allowed these minorities to do so well — even to the point of earning more, on average, than whites? Asian-Americans, for example, have been subject to some of the most brutal oppression, racial hatred, and open discrimination over the years….They were banned from immigrating to the U.S. in 1924. Japanese-American citizens were forced into internment camps during the Second World War, and subjected to hideous, racist propaganda after Pearl Harbor. Yet, today, Asian-Americans are among the most prosperous, well-educated, and successful ethnic groups in America. What gives? It couldn’t possibly be that they maintained solid two-parent family structures, had social networks that looked after one another, placed enormous emphasis on education and hard work, and thereby turned false, negative stereotypes into true, positive ones, could it? It couldn’t be that all whites are not racists or that the American dream still lives? Sullivan is an intelligent fellow, a renowned public intellectual, so the fact that he gets so much wrong here about race in general and Asian Americans in particular indicates how far we have to go. First, there’s just the intellectual sloppiness: Nowhere in her article does Chang say that Dr. Dao was picked to leave the plane because he was Asian. She was asking a different question: Did the United workers or the security officials treat Dr. Dao differently because he was Asian? In a further logical non-sequitur, Sullivan dismisses the question of race because the security officials were African American. As we know from any number of examples, it is not only whites who act in ways that are racially biased. Indeed, we know that blacks can act with racial bias towards other blacks (in the justice system, in education); so why couldn’t black security officials act similarly towards someone who is Asian? Asian and Asian American bias towards blacks is a commonly accepted phenomena—just think of all the stereotypes of Korean store owners or the inclusion of an Asian among the horrifying racists in the recent film “Get Out.” So why is the reverse not a possibility? Moreover, Chang was not just talking about the security officials. Dr. Dao tried to explain to the personnel that he had patients he had to see on the Monday after his flight. We don’t know exactly how the United personnel or the security officials reacted to this statement. Nor do we know if they would have acted in an exactly similar fashion if the person designated to leave the plane were a white businessman in an expensive suit or a pretty young white woman or an elderly white woman or white man. Would the United personnel have responded differently to Dr. Dao’s explanation if it were coming from a white doctor or someone who did not speak with a Vietnamese accent? Would they have been more patient or empathetic with him? Would the security have dragged a 69 year old white women off the plane in exactly the same fashion? But for Sullivan these aren’t possibilities that need to be considered. Sullivan seems to think that because a portion (more on this later) of the Asian American population has done well economically, we must never experience racial bias. Of course we know that middle and upperclass blacks experience racially biased treatment just as we know middle and upperclass women experience sexism. But for Sullivan, somehow this cannot occur to Asians or Asian Americans. And here we come to the myriad ways the experiences and situation of Asian Americans are either completely ignored or distorted in ways that do not at all benefit Asian Americans. Instead such occlusions and distortions serve to bolster white conservative arguments about race in America. Part of this argument runs like this: Because a portion of the Asian American population does well economically, their racial experiences must be the same as—or perhaps even better than—whites. We have now turned all the negative stereotypes into positive ones. Sullivan, like other conservatives, offers no proof of this assumption; it is simply a given. He doesn’t seem to know that this model minority stereotype developed at the same time as the Civil Rights movement; this myth served as a strategic conservative argument against that movement (previously we were never considered model anything). In that argument, the positing of Asian Americans as the model minority—who in the past experienced racial discrimination, but somehow now do not—is an indication that the economic situation of other people of color is their own damned fault. As Sullivan implies: Those people don’t have intact families, they don’t work hard, they don’t do well in school, they don’t keep their communities together. But just as importantly, the model minority myth distorts the experiences of Asian American communities. First, while certain Asian Americans and their communities can be characterized as college educated and middle-class, this is hardly a description of every Asian American population. Asian Americans come from different countries and ethnicities, have different historical experiences, and start off in America with different economic circumstances. The poverty rate of certain Asian American populations, such as the Karin or Hmong, is similar to that of other disadvantaged people of color. Even within the same ethnic group, such as the Chinese, there is a vast difference between a recent immigrant working as a dishwasher in a restaurant and a third or even seventh generation Chinese American working in Silicon Valley. But of course someone like Sullivan thinks we are all alike (but hey, that’s not racist). Moreover, Sullivan commits the exact same intellectual error that other conservative thinkers make. If he doesn’t discriminate against Asian Americans and he has not seen such discrimination practiced, it must not exist. Sullivan apparently hasn’t witnessed police profiling of Asian Americans—as happens to certain working class, immigrant Asian American populations across the country, from Los Angeles to the Twin Cities, where I live. He doesn’t know about Asian Americans being shot by the police in questionable circumstances—such as, in Minneapolis, the unarmed Fong Lee or policeman Duy Ngo who was shot by a fellow officer who thought Ngo was a gang member and not the officer calling for help. But Sullivan’s ignorance does mean these phenomena do not exist; it just means he’s ignorant. Moreover, why would Sullivan be aware of the myriads of microagressions that Asian Americans face each day anywhere in America? Does he see when I or other Asian Americans are standing in line or at a bar or a counter and are ignored? Does he see when I or other Asian Americans are physically jostled or threatened or when we are insulted both in subtle and not so subtle ways in public spaces? Does he understand why Asian American women have some of the highest suicide rates of any population? Does he see when Asian American women are stereotyped sexually and treated accordingly? Does he know how Americans often react negatively to a speaker with an Asian language accent as opposed to Sullivan’s own British accent? Does it matter to Sullivan that Steven Bannon has said that too many Asians own or run Silicon Valley companies? Does Sullivan really think the whitewashing of Asian characters and yellowface absurdities like Emma Stone as a half-Hawaiin/Chinese occur because we are seen like any other Americans? But that is what we face. Constantly, in American society, Asian Americans are erased, occluded or simply not mentioned or thought about. The reasons for this erasure are complicated and multiple. The white use of Asian Americans as the "model minority" myth is part of this. Our absence from the media and from history and other textbooks also contributes. So many, including even Asian Americans, are ignorant about Asian American history, particularly our activism. Witness the way Yuri Kochiyama, who cradled her friend Malcolm's dying body, was erased from the Spike Lee film. Richard Aoki, who supplied guns and military training to the Panthers, has been generally erased from films about the Black Panthers in Oakland. How many know about the Japanese American resistance movement at the Heart Mountain internment camp? Or, for that matter, the all Japanese American 442nd, the most decorated unit in World War II? Or the Hmong soldiers who fought for the Americans in Laos during the Vietnam/American war? Then there's lack of widespread media attention to issues related to Asian Americans: Hate crimes and killings of South Asians in this country have created a climate of terror for those populations, and yet there's been little press about these affected populations. We also have seen the deportation of the Cambodian 8, who came here as children and have never lived in Cambodia, and yet very few discussion of immigration mention them. Then there are constant less major incidents such as the Asian American woman who was recently refused Airbnb housing by the white host; in a text the host wrote that the woman would never enter her home for "one reason: Asian". It is this whole context which must be taken into account if we are going to consider race as at least a question in the treatment of passenger David Dao, either by the United employees or the security officials. Also consider this: We don't know for sure whether race had anything to do with treatment of the Asian American passenger (at least for now), but the terror in his face? The fact that his body was violated with no apparent regard for his dignity or person? Any number of Asian Americans can relate to that. A Vietnamese American friend wrote me that he saw his father in Dr. Dao and the myriad racist things that have happened to his father (as well as my friend) over the years. I see my father and grandfather in Dr. Dao too. But I also see my own terror, a terror that comes from the knowledge that though my family has been in American for more than a century, I will always be in so many ways a foreigner here. I’m a third generation American, and my only language is English. Yet, like many Asian Americans, I know what the question, “Where are you from?” means. And I know the expected answer is not Chicago. In his article, Sullivan cites the 1924 anti-Asian immigrant law and the Japanese American internment as something Japanese Americans have overcome. But I instead look at the recent invoking of the internment camps as precedence for a Muslim registry or the banning of Muslims; I look at Attorney General Jeff Sessions praise of 1924 immigration law. For me, the message is entirely different than the one Sullivan sees: My citizenship and rights can be revoked at any moment if white American deems people who look like me a threat. I will always be more associated with Asia than I will be with America. So this is how I live: When I walk into any environment in America, racism is a potential threat--covertly, overtly. And, yet, at the same time, I know many like Sullivan believe Asians and Asian Americans shouldn't even be considered in any discussion of race in this country. And that is one of the ways racism works. https://www.theatlantic.com/magazine/archive/2014/06/the-case-for-reparations/361631/). Similarly, my father was able to work at places which did not hire black workers or would not hire black workers for several years. David Mura is the author of the memoirs, Where the Body Meets Memory: An Odyssey of Race, Sexuality & Identity and Turning Japanese: Memoirs of a Sansei, which was a New York Times Notable Book and won the Oakland PEN Josephine Miles Book Award. He's written four books of poetry, including The Last Incantations, and the novel Famous Suicides of the Japanese Empire. He's working on a novel and a book of essays on race in America. He's Director of Training for the Innocent Classroom, a program designed to address the racial achievement gap by helping teachers to improve their relationships with students of color.